WASHINGTON, July 20 (Reuters) - U.S. Senate Republicans, scolded by President Donald Trump for failing to overturn Obamacare, tried to salvage their seven-year effort for a new healthcare law on Thursday, but leading senators indicated frustration over shifting goal posts. Trump on Wednesday told the Senate's fractured Republican majority to revive a bill to repeal and replace Obamacare that collapsed on Monday after Republicans from both moderate and conservative factions pulled their support. But after a late-night emergency meeting on how to win over holdouts appeared to yield no progress, senators expressed irritation. 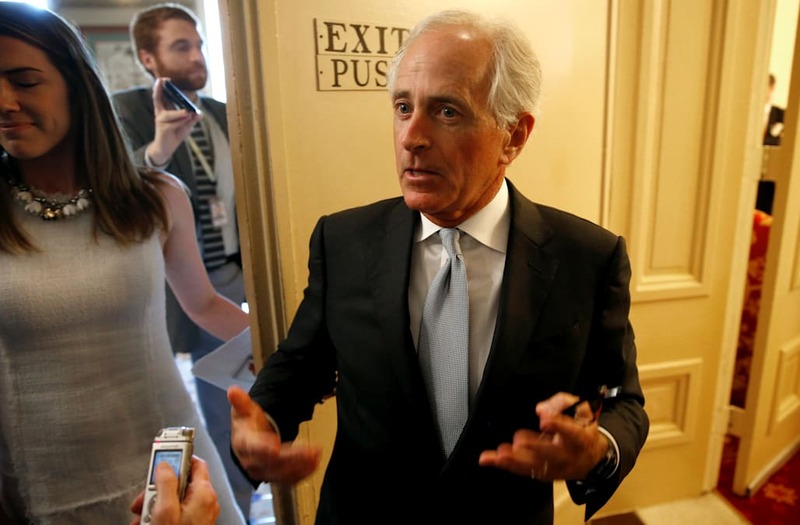 "It really is starting to feel like a bazaar, $50 billion here, $100 billion there, and I feel like it's losing coherency," Senator Bob Corker said. Susan Collins, a moderate Republican who strongly objected to the revised bill, said she didn't "even know what we are proceeding to next week" and said Trump had contributed to the "lack of clarity" over the next steps. "I'm unclear, having heard the president and read his tweets, exactly which bill he wants to pass and whether he is for just repealing, or repealing and replacing - whether he's for the Senate bill," Collins said. Trump, who had campaigned heavily on a promise to repeal and replace Obamacare, the signature legislative achievement of former Democratic President Barack Obama, took a hands-off approach to the healthcare debate last week. On Tuesday he suggested that he was fine with letting Obamacare fail. But on Wednesday he switched course and demanded that senators stay in Washington through their planned August recess until they find common ground on healthcare. The repeal and replace bill crafted by Senate Majority Leader Mitch McConnell would leave 22 million Americans without health insurance coverage by 2026, the nonpartisan U.S. Congressional Budget Office said on Thursday. Before Trump's Wednesday lunch with 49 Republican senators, McConnell had planned to hold a straight repeal vote next week, but that appeared doomed with several Republican senators having already said they oppose that approach. The CBO said on Wednesday that 32 million more Americans would lose their insurance coverage by 2026 under a bill that would repeal much of Obamacare without a replacement. That compares with the 20 million who have become insured under Obamacare, as the Affordable Care Act is known. The Senate's number two Republican, John Cornyn, said he expected a procedural vote on Tuesday to take up a healthcare bill, but said knowing what the healthcare bill will be before the procedural vote is "a luxury we don't have." An aide to Cornyn said he was referring to the amendment process that could change the bill once it is on the Senate floor. "It's difficult to predict what the final product will look like," the aide said. Adding to Republicans' woes was news late Wednesday that Senator John McCain has aggressive brain cancer. With a narrow 52-48 Republican majority, their fight for votes becomes even more difficult. McCain, a Republican known for his feisty independence, tweeted, .".. unfortunately for my sparring partners in Congress, I'll be back soon, so stand-by!" As they sought to break the impasse, senators were discussing changes to Medicaid, the government healthcare program for the poor that was expanded under Obamacare. One possibility would give states flexibility to use Medicaid funding to help cover healthcare expenses of people who would lose their Medicaid coverage under the Senate bill's sharp cuts to the program. Senator Rob Portman, one of the undecideds on the healthcare bill, called the proposal "progress." But Collins said she had not heard a Medicaid proposal that would tempt her to vote yes. Republicans say Obamacare is a costly intrusion into the healthcare system, but the party is divided between moderates concerned the Senate bill would eliminate insurance for millions of low-income Americans and conservatives who want to see even deeper cuts. McConnell revealed little of his next steps but said Republicans were not giving up. "The fight to move beyond the status quo of Obamacare was certainly never going to be easy," he told the Senate on Thursday. "But we've come a long way, and I look forward to continuing our work together to finally bring relief." The dramatic week at Congress and in the White House was taking its toll. "I'm getting a little anxious," Corker said. He said the best approach would be a repeal, with a delayed effective date by which time lawmakers could develop a replacement. Democrats, who are united in their opposition to the Republican efforts and reveled in this week's deadlock, told Republicans to abandon their healthcare efforts as they appeared no closer to reconciling policy differences after Wednesday's meeting. "It's time for Congress to pivot away from the bills that are going nowhere," said House Minority Leader Nancy Pelosi.